Do you have or know any news about the Atelopus species? please let us know. Send us an E-mail! New species discovered in Colombia. Also an Atelopus species. Harlequin frog of the Atelopus genus potentially new to science discovered in a Rapid Assessment Program (RAP) suvey conducted in Colombia during which 10 species of amphibians believed to be new to science were found. Credit: © Conservation International Colombia, photo by: Marco Rada. June 2008. The stiffened corpse of a female lies sprawled in the shallow water as a male clings to her back in a desperate effort to mate. 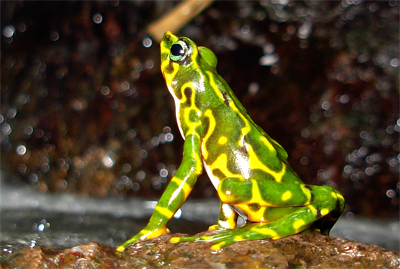 He is among the last of the surviving Limon harlequin frogs – or Atelopus sp. A brilliant bright yellow and black species that is known to breed in just one stream in southern Ecuador: but for how much longer? Critically Endangered Harlequin Frog Rediscovered in Remote Region of Colombia. March 2008. 14 years after it was last seen, the Carrikeri Harlequin Frog (Atelopus carrikeri) has been rediscovered in a remote mountainous region in Colombia. The critically endangered Carrikeri Harelquin frog was rediscovered in the Sierra Nevada de Santa Marta Mountains in Colombia’s Magdalena department. Colombia is one of the world’s richest countries in amphibian diversity with more than 583 species. Unfortunately, in the past several years, there has been a decline in amphibian populations, especially in higher elevations in Colombia. The Carrikeri Harelquin frog is native to the Sierra Nevada de Santa Marta Mountains in Colombia’s Magdalena province. The 5 centimetre long frog lives in the paramo habitat at an attitude of 4,000 metres. This population is unique since it possesses orange markings, which are unusual for this species. Páramo is a neotropical grassland ecosystem found in high elevations between the tree line (About 3,100 metres) and the permanent snow line (about 5,000 metres) and is often dominated by very camp mists. Nearly 57 percent of this ecosystem worldwide is found in Colombia. The discovery was made by several young scientists supported by the Conservation Leadership Programme (CLP), and the expedition was led by Luis Alberto Rueda, scientist for the Project Atelopus team. In addition to Rueda, who is part of the GECOH (Grupo de Ecofisiología, Comportamiento y Herpetologia) of the University of the Andes, the individuals who are part of the Atelopus team of scientist include: Oswaldo Cortes, Giovanni Chaves, Erika Salazar, Jose Gil, Sergio Pulido, Astrid Nossa, Fabian Tavera, Jenny Gallo, Ximena Villagrán and Nidia Rodriguez members of the Ecodiversidad Colombia Foundation (www.ecodiversidad.org).